‘Bohemian Rhapsody’ has hit cinemas and disco is the talk of the town this year. 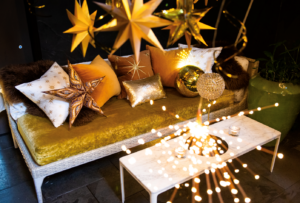 Channel your inner Grace Jones this festive season, and indulge in pure decadence and music of the era at the Studio 54-style Secret Garden at South Place Hotel. It’s a hedonistic playground where All That Glitters is Gold. The party starts on 27th November. The Secret Garden is London’s best kept secret in the heart of the city… but not for much longer. With a strict glamour-only dress code, make sure you dress for the spotlight for All that Glitters at the Secret Garden. There’ll be glittering disco balls swinging from the ceiling, so get ready to light up the dancefloor. From canapés to bubbles, everything will be shining bright in golden hues. Raise a toast to the best time of the year with a glass of Moët & Chandon Champagne and perfectly paired with twists on the traditional festive nibbles, including pigs in blankets and mince pies. After a night of dancing, kick back and relax on plush, velvet sofas adorned with sequins and plenty of glitter, and nestle those party feet into chocolate-brown, faux sheepskin rugs decorating the space. With 80 beautifully depicted rooms on your doorstep, there’ll be no rush to head home after the celebrations. Available for private hire and perfect for friends and colleagues alike, why not host the season’s sexiest Christmas party with All that Glitters at the Secret Garden.